This coming fall, I will be going into my senior year of high school and naturally, applying for colleges and scholarships. This is one of my essays that I’m planning to use this fall and I thought it would be a nice way to get back into writing on the blog. In the four years leading up to our last goodbye, my mother was given a medley of gifts by the medical profession. The first gift was just the beginning. With a big tag labeled breast cancer, it showed up in the middle of our lives wrapped in a big pink ribbon, no card or instructions, and alas no gift receipt. Its arrival was marked with tears and puffy eyes. I used to hate the idea that there would ever be a reason that this disease was addressed to my mom, but it was she, that showed me how to take each gift with grace. Even the ones that make you cry. It wasn’t until the end of my sophomore year, when final gift arrived at our doorstep. Like before there was no card or instructions, and no gift receipt, except this time the once ambitious pink ribbon had faded, and the tag was not labeled with a diagnosis to start a fight, just a time: three to six months. As my mother described, they were the days we had together and the days we did not. And it scared me so much. I had been given a time limit with the person I loved and through everything loved me. To think that three to six months would hold the last memories with my mom was not at first an idea I wanted to accept. Up until then, we had all taken on breast cancer as a fight. We wanted to win; however, it was my mom that showed us the beauty in accepting this time as a gift. And through her strength, I understood that acceptence did not mean surrendering. Accepting this gift of time was allowing myself to have a beautiful, long goodbye with my mom. I knew that she might not be there as I graduate high school, or walk down the aisle, but I would go through my life knowing that I was given the time that so many people never even get the chance to have. A gift of goodbye. As one would presume, our goodbye brought along many tears, but it also brought memories, and joy, and most importanly, grace. I had listened to so many people tell me how strong my mom and my family was, and yet I don’t think it was strength that was holding us together. I believe that through the gift we had been given, we had all gained a feeling of grace. A grace that would accept even the heartaches as memory of a beautiful goodbye. The first morning I went back to school after my mother’s death the air was still. As I stood in the grey light that hinted through the French doors on the back of our house, I could feel it aching to be revived by the sunlight. I was ready to go back to school, but I couldn’t help but linger for a few more minutes. My feet paced against the hardwood floor like ships waiting for their anchor to snag the bottom. Usually I raced out of the house in the morning, but that morning I couldn’t shake the feeling that I was forgetting something. By then the clock was pushing me along, so I went to tell my dad I was leaving. He stood in the kitchen, trimming another set of sunflowers from the pervious days’ services to put in a vase. As I saw the flowers lining the counter, I felt that knot tighten in my throat. This morning goodbye would have to take the place of two. “Goodbye. I love you.” He said as he kissed my forehead and held me, backpack and all, a little tighter than most mornings. Walking through the halls to my first class, I couldn’t help but wonder if the people I passed had said goodbye to their mothers that morning or if they hugged their fathers before walking out the door. I hope they did; even the smallest goodbyes are gifts. I spoke at my mom’s service today, and afterwords, I had peace. If you’ve ever been to our home before, one of the first things you’ll notice is that we have quite a few suns that we’ve collected throughout the years. And, whether or not it was a weekday goodwill find by my dad or a birthday gift from me and my sisters, each one meant something to my mom who loved suns. 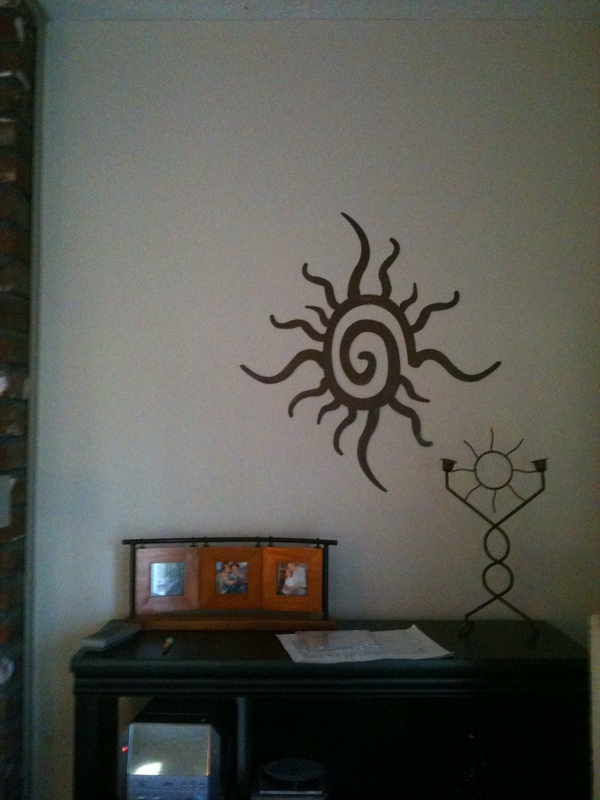 I brought with me, my favorite sun at our house where it hangs on the wall over my mom’s chair. This sun was a birthday gift from me and my sisters about two years before she was diagnosed when she got the crazy beautiful idea of planting a garden in our wild field of yard. Where of course she was planning to grow sunflowers. The first warm weekend in May, it took two trips to the nursery to get all of the soil and supplies we needed for that garden, and it was during the first trip that my mom pointed out this sun. Knowing her birthday was coming up, my fifth grade head got the idea to get it for her. So between dropping off loads of soil, my sisters and I raced up to our rooms, scrambling to pull together the money to buy the sun and when we returned to the nursery we secretly bought it and hid it under the seats of the car to get it home. Then a few weeks later, we surprised her with it on her birthday. She loves this sun, but this isn’t a real sun. My mom is my real sun. She is my light and my warmth through whatever blizzards life has to throw at us. Her life was an inspiration to all those who she was blessed to meet, and I cannot even begin to describe the joy it brings me and my family when someone tells us they were touched by my mom’s story. She is a light that shines with grace and strength, and one that not even death can put out. The first couple years after my mom was diagnosed with breast cancer, I used to hate the saying, “Everything happens for a reason,” because I couldn’t accept that there could ever be a reason for my mom to have to fight for her life against such a vicious disease. I use to fight those words. Yet reflecting back on my mom’s journey and the memories we share, I see how much closer my family has become and how much grace and wisdom my mom has instilled in all of us. She was strong, and if there is one thing I’ve heard more times than I can count the past four years, it’s how much strength she and my family have. Cancer was a fight, there’s no doubt about that, but if there’s one thing she taught me, it’s not to face life with fighting strength but with shining grace. One can only fight so much before the fight takes more out of you than whatever you had to fight with in the first place. It was a year ago when my mom put down her pink boxing gloves, and I remember her telling me that when she prayed, she no longer asked God for strength or courage, but that she prayed for grace and peace. I never forgot those words, and I know that it’s been grace rather than strength that has kept my head up these final months so that I can be the light my mom has lit in me and my sisters. One of my mom’s first blogs was about her love of long goodbyes. And what a beautiful long goodbye we were blessed with. Filled with both laughs and tears, our long goodbye was a precious gift of time that brought us all closer, so that our goodbye didn’t really feel like a goodbye at all. My mom was always honest with my sisters and I, and as difficult as it was her to tell us about the days we have and the days we do not, it was best gift we could have had. The biggest lie in the world is that ignorance is bliss because there is nothing that can replace the long, loving, tender, cherished goodbye we had with my mom. My mom is my sunshine, and it may seem like cancer took my sunshine away, but I think that idea ties with the biggest lie in the world. My mom will always be the sunshine in my life, and she’ll be shining on each one of her daughters as we graduate and walk down the aisle at our weddings and have children of our own that will get to hear countless stories about the wonderful grandmother that is watching over them. She’ll be shining on my dad, her quiet, understanding husband, as he keeps taking pictures and uses the gallery that they designed together. She’ll be shining on my aunt, her warrior sister, as she keeps us all together and we show her the places my mom loved to go and the things she loved to do. She’ll be shining on my grandma, her mother of unwavering love and support, as she holds on to her six grandchildren who love her so much and remembers that it’s okay to cry big tears because they make way for big joy. Through skies both blue and grey, my mom will be shining with us as our very own sunshine and we love her so much. The story is about a mother and her son, and how as the son grew up there were days that the mother thought she was going to go crazy with various troubles her son got into, but at night when the son was asleep the mother would come into his room, rock him “back and forth,” and sing him the little song. The mother does this as long as she can, but at the end of the story, time has passed and the mother is very old and sick and can hardly sing the song. So the son who now grown with a family of his home goes to visit his mother, and when he visits her, he picks her up just as she had done with him and rocks her “back and forth” and sings the little song replacing “baby” with “mother”. It was our turn to sing the little song. My mom devoted her life to ones she loved and gave so much into making sure that my sisters and I would be okay now and in the future, but at that moment it was our turn to have strength and grace for her. And I am so thankful to have been given the gift of time with my mom, however short it may have seemed, because so many people don’t get the time to have the “long goodbyes” that my mom loves. Time is a precious gift and I will always cherish the joys and heartbreaks I experienced with my mom. My mom said very little in her final hours, but the one phrase we picked out multiple times was “I love you.” I suppose you could say, “I love you,” were my mom’s last words, but I don’t believe in last words in the sense that they are the last. I along with my family believe with all our hearts that my mom is always with us, keeping us strong and at peace with life. As we move forward, I will carry all of the virtue and grace that my mom instilled in me and my sisters. From graduations to weddings to starting families of our own, my sisters and I know that our mom is there with us. In the mean time we are there for each other as we mourn the loss of a remarkable woman, but more importantly and as she would hope for: celebrate the wonderful life she lived. I love you Momma. I am watching the Olympics and like most people, I am just amazed at the athletic ability of those I witness performing at the highest level in their sport. Bulging biceps, lean torsos, incredible strides, amazing flexibility and speed, these bodies are perfect specimens of the human race. Perfect human form. But my favorite part of the Olympics is the emotions displayed, especially those of remembrance or gratitude. Take Felix Sanchez for example. He ran the men’s 400 with a photo of he and his grandmother, who passed away in 2008 pinned beneath his race bib. After he won gold, Sanchez pulled out that picture, placed it down on the track, knelt and kissed the image of the woman who raised him. That is my favorite part of the Olympics, gratitude and heartfelt emotion. I can admire an athletic body, but it is the soul that captures my heart. C.S. Lewis once wrote “You don’t have a soul. You are a soul. You have a body.” I have a body alright and compared to those I see on TV it is in pretty bad shape. My body has been through a war in the past four years and I have the scars to show it. Despite my four half marathon accomplishments since my diagnosis in 2009, today I can barely walk across a parking lot without gasping for air. My favorite thing of all to do, sing along to the radio, is about as easy for me right now as the Olympic uneven bars. Today while waiting for my daughter at the doctors office I was eying up one elderly gentleman’s oxygen tank, comparing it to mine and thinking his had way cooler features. Yes, scoping oxygen tanks and scooters is my new hobby. But that is just my body. And while it may not be winning me any gold medals currently, I am neither sad nor angry. My soul lives on, strong and happy and healthy. I smile most of the time. I have long talks with my kids and my husband, and I feel and appreciate every ounce of love coming to me from so many other great souls. Daily, I am overcome with gratefulness and thankfulness for the many blessings of my life, for my family and for friends both old and new who are making such a beautiful difference for me right now with their love. Angels are among me, and with them I sing and dance, in my heart, without a care about oxygen, or lack there of. My soul is alive and well and I am ready for the challenges before me. I can see a door opening in front of me to all of the love and energy of the world and of the universe, my medal stand perhaps. Know this, after my race ends, I will pull from my bib a photo of everyone who gave of themselves for me and for my family, and I will kneel and kiss it. And I will be happy and grateful for all I have been blessed to know and love in this world. And that is my favorite part of living.